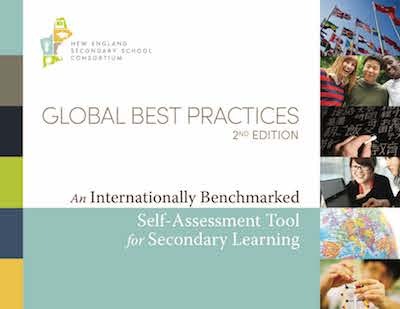 Global Best Practices: An Internationally Benchmarked Self-Assessment Tool for Secondary Learning is a practical, action-oriented resource for secondary schools. The tool grew out of a recognition that national borders no longer define the knowledge, skills, and habits of mind that students need for success, and that New England’s high schools may need assistance reviewing learning standards, organizational structures, leadership models, teaching strategies, professional development, and student outcomes in relation to research on high-performing educational systems and research-based practices. Global Best Practices offers schools a practical, step-by-step process they can follow to assess their relative performance in critical areas and shape their school-improvement plans. This concise, user-friendly guide provides a selection of recommended facilitation strategies for educators who are using Global Best Practices to inform their school-improvement work and action planning. It will help facilitators and school leaders design goal-driven activities for small- and large-group work sessions. While there are many ways to configure and organize a work session, the agenda described in this guide is designed for a full-faculty work session. But for schools that are completing the self-assessment in smaller groups or for shorter periods of time, the agenda will still provide a basic framework that can be modified as needed. In the coming months we will be updating the Facilitators Guide to reflect the recently released Global Best Practices 2nd edition. During the development of Global Best Practices, an abundance of research studies on effective secondary schooling, both in the United States and abroad, were consulted. In the effort to balance inclusiveness and focus, this summary presents two main types of research:  meta-analyses and comprehensive projects that distill useful findings from a wide range of existing research, and  focused investigations conducted by individuals or organizations that represent a coherent body of research in a particular area. Our hope is that this research summary will not only become an indispensable companion to the tool, but that it will serve to stimulate self-reflection and professional inquiry in secondary schools across New England. In the coming months we will be updating the Facilitators Guide to reflect the recently released Global Best Practices 2nd edition. Drawing from the fields of education policy, school redesign, organizational change, leadership development, and program evaluation, the High Leverage Policy Framework is a detailed exploration of education policy from rationale to development to implementation. By taking into account the larger social and political “ecosystem” in which policy is formed, written, and implemented, this tool provides policy makers and educators with a step-by-step framework they can use to identify and develop effective, high-impact policies in their states, districts, and schools. Using a common definition of high-leverage policy—i.e., policies that not only increase educational equity, aspirations, achievement, and attainment for all students, but that also generate positive change throughout the educational system—the High Leverage Policy Framework is a first step toward a more holistic view of education policy, leading the way for more thoughtful and sustainable guidelines for learning in the 21st century. 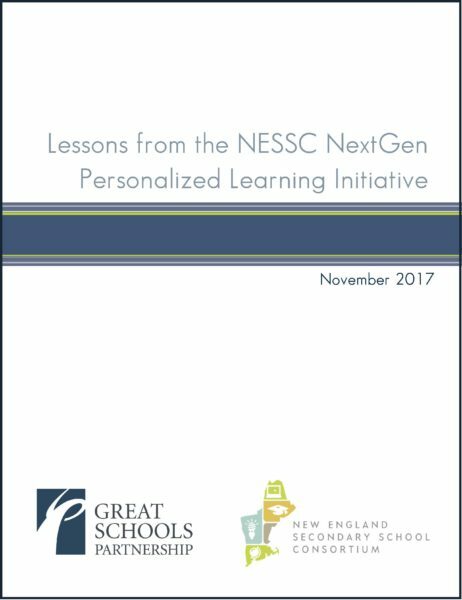 In 2014, the New England Secondary School Consortium (NESSC), in collaboration with the Great Schools Partnership (GSP), initiated a three-year NextGen Personalized Learning Initiative. This report shares what we learned alongside school partners as we supported their transformative change efforts. In particular, it focuses on how the implementation of personalized, proficiency-based education looks different from school to school and across states depending on a wide range of contextual factors. It also reflects on the challenge of designing short-term interventions that hold promise for sustaining ongoing school-wide transformation in the longer-term. The NESSC NextGen Personalized Learning Initiative was designed with the aim of supporting a network of schools in accelerating school-wide transformation toward personalized, proficiency-based learning. From June 2014 through June 2017, GSP staff worked alongside 21 school leaders and their staff to design and implement personalized, proficiency-based learning systems tailored to each school’s priorities and needs. This project was funded through a grant awarded by the Next Generation Learning Challenges (NGLC) Regional Funds for Breakthrough Schools initiative.